Everything you need to turn your stripped lower into an A2 rifle lower. Kit comes with a Palmetto State Armory classic lower parts kit with A2 grip, Rifle buffer extension, buffer and action spring, spacer, screw and A2 trap door stock. Will this kit work with a mid-length gas system dissipator upper purchased from you? Can this a2 kit be used with a 9mm receiver and 9mm carbine upper? BEST ANSWER: You will need to use a 9mm buffer and possibly a block of some sort to prevent the bolt from traveling too far rearwards. Will this work for pa10? BEST ANSWER: No it will not. Some of the parts are different. Will this work with the PSA PA 47 complete upper? Or do I have to use a carbine buffer tube with it ? Will this kit work with PSA’s 18” .223 Wylde barreled upper? 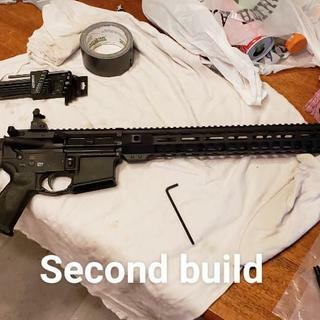 BEST ANSWER: The 18" 223 Wylde upper I bought from PSA has a rifle length gas system and should work great with this lower kit and rifle length buffer/buffer tube. This is a great kit that will work with any stripped .223 lower. Buffer is the right size/weight for 18" barreled rifle. Good quality for the money. Yes works very well. Feels great and is very nice shooting combination. If I could attach a pic. I would show you how mine turned out. Will this buffer tube and stock work on a PA10? I plan on putting these parts in a 5.56 build, but I want to use the buffer tube and stock on a PA10. 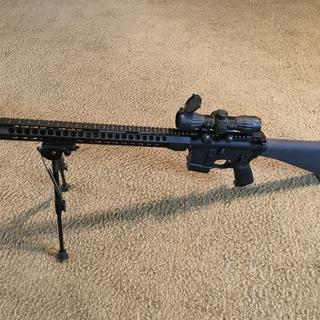 Will the tube and stock work on the .308 if I get a 308 spring and buffer? Yes, I'm so Old School that I didn't spell it "Skool" like the young-uns do. I was trained on a M16A1 full stock many years ago. Nowadays, I don't do CQB, breaches or wear body armor. I prefer a full stock when I do most of my shooting; sitting under cover while bench shooting. I have no need for the "coolness" of an M4 stock (but yes, I still have them) while target shooting. Yes, the stock is gray-ish, but a few coats of CLP makes 'em perfect. The LPK fit in my PSA lower receiver with zero issues. Highly recommend, waiting for them to come back in stock to order a few more. Difficult to get the parts, takes a long time, but always worth the price. The A2 stock reminds me of the first time I shot an M16 rifle. I still have the qual target of the 40 for 40 hits. The feel of the stock is great for old timers that earned their marksman ribbon on the M16 and anyone that wants sturdy consistent shooting platform for your AR style rifles. Good kit, get them before they sell out, an EPT kit would be even better. I would recommend this to anyone looking for a budget gun build. All of the parts are good quality parts for the money. Worked well, as expected. Disappointed in the color of the stock, a lot grayer than I would have preferred. I bought this lower parts kit to finish a M16A2 clone build and every looks and fit together great. Very satisfied with the quality for the cheap price i paid. Decent piece. Just disappointed the stock was more of a grey color than a black color. Purchased kit for a Palmetto lower receiver to attach a .458 SOCOM upper receiver. Parts arrived and were separated and packaged into various groups. Made assembly easy as I didn't have to go through a pile of parts and determine if I picked up the right part. All parts fit perfectly and required no fitting. Upper attached to the lower without any issues. Gun functions flawlessly. I would definitely recommend this kit to others. There's something special about a fixed A2 style rifle stock. The stock is kind of gray/green/black, but I think it looks great. The rest of the kit great too. Of course it's the thing to have for a rifle length upper but it's a must for a dissipator build. Great build kit. Looks awesome! The spare retention pin and spring are great inclusion in this kit. I average one set lost per every pivot pin installation, so it comes in handy. The kit installed smoothly and functions properly. Yes, I would recommend this stock for anyone that would want a fixed stock. Well made, install was simple. I would've liked the color to be black, but I understand I now have a choice of what I can color. Camo, Black. Worked awesome at the range. Very happy with your product. Quality components and easy build! Bought two for two different style builds. Great quality on both and they went together with ease. Stock spaced on one was loose and needed to be shimmed with an O-ring which is the only reason for four instead of five stars. If you live in one of the “no adjustable stock” states than you can’t go wrong. Why have a pinned and fixed adjustable. When you can have a fixed stock with a field cleaning kit right on board. Functions great with both Carbine length and Rifle length uppers. Exactly what I needed for my A3 build. Stock color matches the gray dry film on most aluminum mags. Trigger seems smoother than most other ‘mil-spec’ kits. Goes great with the 20" upper and shoots great! Grab them while they are in stock. Fast shipping and each section was packed individually. Was easy to see all parts were there before opening. Bought this kit to finish off a couple of builds I was working on. It worked out to be less expensive to buy the one kit to get a lower kit and the buffer and A2 stock I needed. All the parts went together with no issues. Took the weapons to the range a few days later to function fire them had no issues. Put about 200 rounds down range no failures at all. Perfectly happy with the parts and service. All parts fit perfectly. Everything was packed well in the box and shipping time was as stated. I installed this on an Anderson lower one thing to watch out for is that Anderson no longer completely taps the hole for the grip bolt. The bolt supplied was too long. Bought a 3/4 long bolt from the hardware store and used that. This is not an issue with the PSA parts kit but with the Anderson lower. Just FYI in case you order this for an Anderson lower. Pickup a 3/4" bolt while you wait for your lower kit to arrive! Great product! Thank you PSA! The kit was complete I had two minor issues. The bolt for the pistol grip was to long. I added a washer not a problem. #2 was the chanel in the pivot pin was rough which I didn't notice until I had the detent in place. I put and drop of oil on it that helped some still not a big deal. I am going to respring with JP springs and polish the trigger. Overall I'd buy the kit again. 3rd PSA purchase in as many months. Completed my Anderson lower with it. All went together as expected. Ordered Monday night sitting on my porch at Thursday afternoon. Now waiting on the 7.62x39 uppers to hit the Daily Deal page. i couldn't be more pleased [again]!i don't know how some of these bad reviews come up from time to time.sometimes i think they're competitors buy from them and get jealous of the great quality at a fair price and write a bad review just to get back at them. i have made numerous orders from psa and they have all been excellent.this kit is no exception.this kit was at my door in 3 days and properly packaged.i prefer psa over any other manufacturer [and that includes coltetc.etc. ].they sell parts that are equalif not better than anyone elseand at a working man's [or woman's]price.don't hesitate to order from them.thanx psa.